Homemade doggie costumes can easily be made out of felt, paper and of course material. Or try adapting some baby clothes or costumes to fit your pooch. 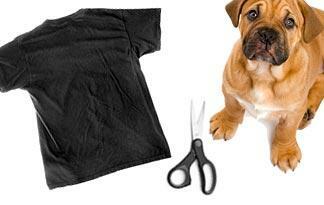 Here is a list of costumes for your dog that can easily be made at home. A super hero is probably one of the easiest costumes to create. What is the most common thing associated with super heroes? The cape! Using a piece of material in any color you choose cut out a long triangle. You can get creative and cut out an initial or decoration out of felt and hot glue it onto the material. Attach a piece of ribbon to the tip of the triangle that will tie around doggie’s neck. About 2/3 of the way down, attach another piece of ribbon to both sides of the triangle to tie around the dog’s under-belly. You can hand stitch the ribbon or try gluing it, as long as it is secure and long enough to comfortably tie around your pet. If you consider your dog to be your baby, try a funny approach to his costume and simply dress him up as a baby. You can try a diaper, a bib or a bonnet. You can use anything you would find on a baby that your dog can easily wear. For an added touch try pushing him in a stroller. Common outfits for little doggies tend to be the angels and devils. This may be because they can be super easy to make. To make angel wings cut the shape from a piece of cardboard and glue on some ribbon to tie around him and keep them in place. Decorate your wings with white feathers and glitter or use your imagination. If you would like to add a halo, find two pieces of heavy wire. Make a ring out of one and wrap with white ribbon. Attach one end of the second wire to the halo you made and the other end to the top of the cardboard wings. Bend the wire so the halo floats over your dogs head. This way you will not have to find a way to attach the wire to any part of his body. For a little devil dog all you really need is a headband to fit your dog and some red felt. Cut out little devil horns from the felt and glue onto the headband. Now he’s ready to go and everyone will know exactly what he’s supposed to be! A very funny dog costume can be a bunch of grapes. Find a baby shirt that will fit your dog and get lots of purple balloons. Blow up the balloons but not too big that they might scare your dog. Tie them and safety pin the bottom of the balloon to the baby shirt. Put them really close together to form a bunch and if needed, use tape to keep them stuck together. You can cut out leaves from green construction paper and tape them to the front by his ears. He may start off walking into things but he should get the hang of it!